This game has 3 different games in its series and errr the names make me laugh. The games in order are dousei kareshi butterfly lip, dousei kareshi butterfly gloss and dousei kareshi butterfly rouge (last one released a few days ago). I don’t understand the need for the “butterfly” in the title plus a random make-up related word? Like what o_o Okay maybe the butterfly is related to black butterfly which is the company that made it. 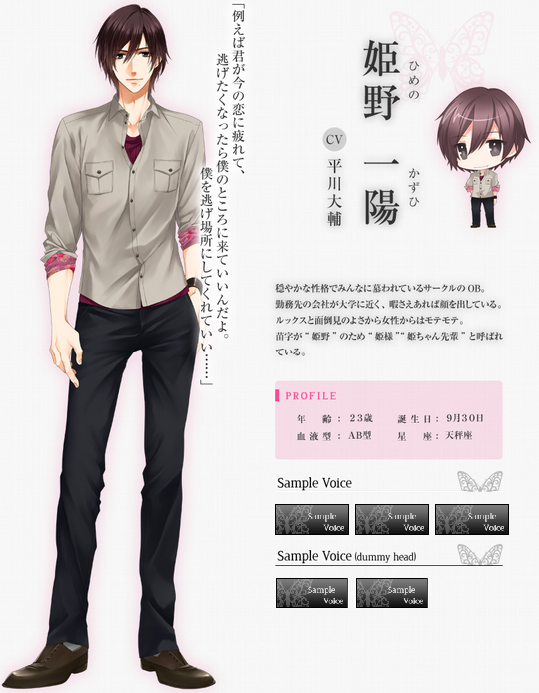 Ichinose Kei, Hina’s boyfriend who asks to live together after they’ve been dating for a year. He’s in the same year, friend circle, and club as Hina. Before I played, I read some reviews and people said he was kind of immature. I was like “it can’t be that bad though right?” But actually yeah I did feel it after all 😦 But he’s quite sweet at times! Also whoever draws the chibi forms of them does a good job because they’re quite cute! ^^ He’s voiced by Kishio Daisuke whose voice I am familiar with from Starry Sky in Autumn and I neither love nor hate his voice so that’s alright. Btw I would pick him a billion times over the other guy sorry. 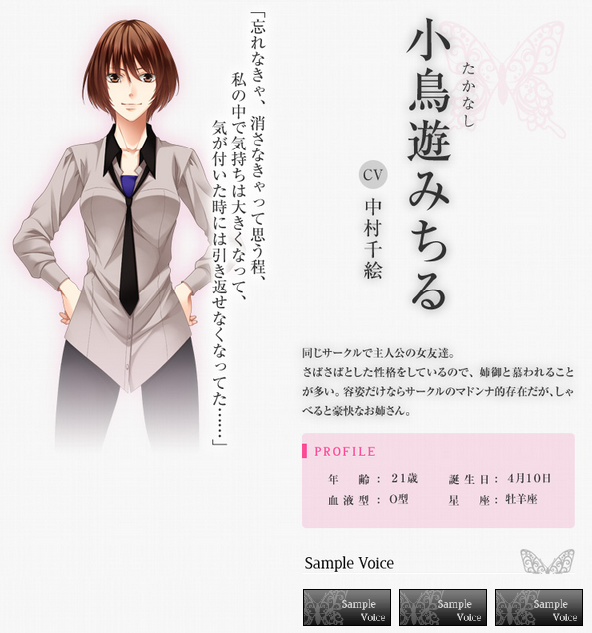 Himeno Kazuhi, your potential cheat partner. 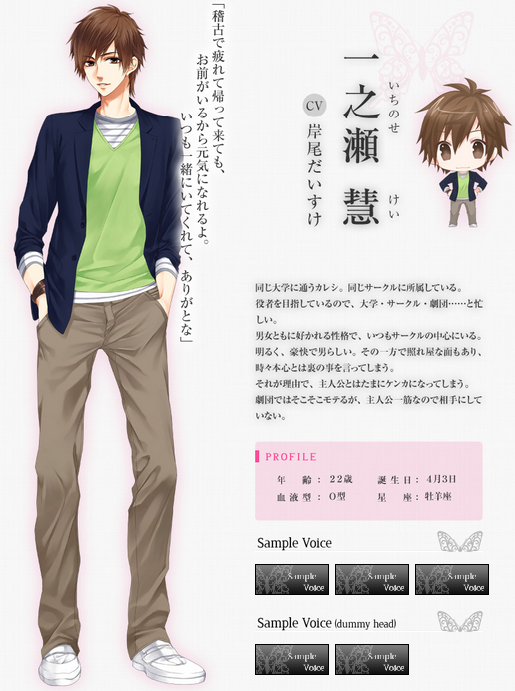 He’s two years Hina’s senior and was the head of the theatre club but graduated and now works at some company. He’s liked Hina since he met her but never worked up the courage to confess and then she started going out with Kei… When Kei and Hina have problems about all sorts of random stuff he’s always there to cheer her up. What made me laugh is out of these two main reviews I found for this game, one of them preferred Kei over Himeno and calls this guy “hime-creep” because he honestly appears out of nowhere to where Hina is and I actually agree and it is a little creepy x_x The other reviewed liked Himeno better since Kei’s occasional immaturity got on her nerves lol. When Kei first meets him, he calls him “Hime-chan senpai” which is hilarious because it kind of means “princess-chan senior” since hime (the kanji in his name) means princess LOL. He’s voiced by Hirakawa Daisuke who SO many people love but for some reason I really really don’t like his voice It’s too bad he’s in like everything and then my interest in the character he voices or the game he’s in makes me not interested in it anymore I’m familiar with his voice because he voiced a character in Starry Sky in Winter. 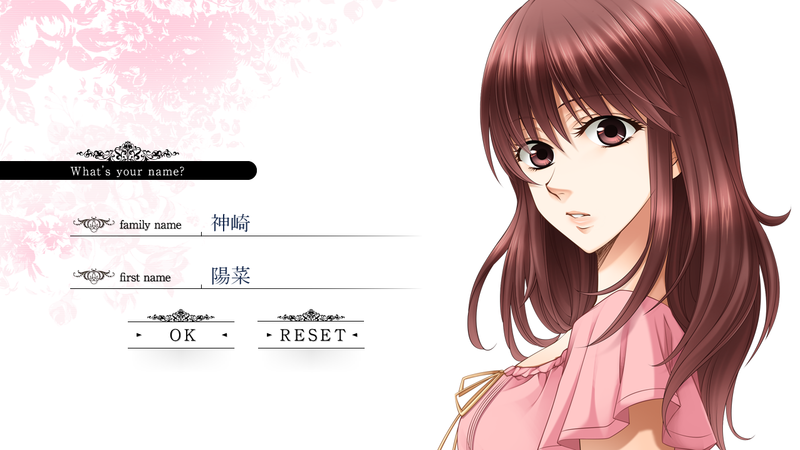 Takanashi Michiru, Hina’s token girl best friend (there always has to be a female friend for the MC to balance it out). She’s in the same year as Hina and Kei. Unfortunately I don’t know if I really consider her a best friend since some of her actions/thoughts are questionable Like once to Hime she says that what he’s doing is “hurting Kei… err I mean Hina.” Other reviewers got that feeling as well. In any case I love how she only got a knee up CG here lol.